To Rap or Not to Rap? 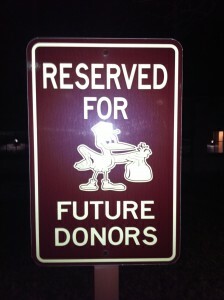 Sometimes it’s hard to tell what is and isn’t funny or appropriate – and ultimately the donor or prospect will decide. I won’t make any comments on this one, but will post it for you to form an opinion. Below the video, I’ve pasted in a few comments they have received so far – it’s too early to tell what the actual results are – perhaps I will contact somebody at Thunderbird to find out more about the return on their investment in a few weeks. Creative?﻿ Yes. Inspiring? No. Embarrassing for the brand? Most definitely. schools, like all non-profits, have﻿ to find ways to fundraise. at least these development officers put a little creativity & fun into their ask! i hope their campaign this year is wildly successful. I﻿ will make a ‘donation’ for this video to be taken down. This is horrible. ﻿ Please take this off now. You have totally embarrassed and ruined the integrity of a professional top ranked business school. Definitely what I would expect from a top tier﻿ business school. What do YOU think? How would your organization react to these early comments? A little something to make you smile today. 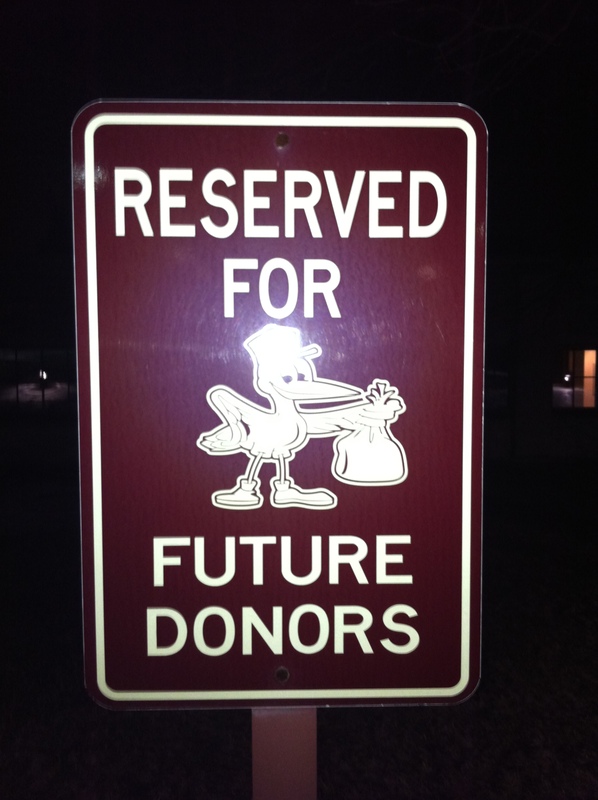 . .
We’ve had two of these signs in our employee parking lot for years, and they never fail to make me smile. All the other signage is traditional, but when looking out for the expectant mothers, we have two spaces by the door with signs that really stand out! I’ll never be an expectant mother, of course, but I still chuckle every morning when I arrive for work. Given the number of births we’ve had lately, the future of our donor count is lookin’ good! In 2009, I wrote a post about “The Perfect Intersect” that I would like to revise. Not because I believe any less in the value of the post, but because I’d like to add a very important caveat. The donor is trying to utilize their financial resources to make a difference in some way that is meaningful to them. The best situation for everyone is when the interests of both parties overlap. A lot. 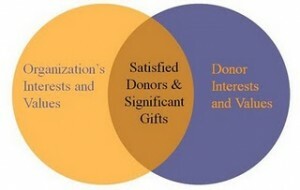 The closer the organization comes to meeting the donors’ desires, the more likely they are to receive a gift. As the overlap increases, so does the size of the gift. And, if all goes well, it might be the first of many. And now, to add just a bit to the original. . . Sometimes, the intersect doesn’t happen. The donor has an interest that simply isn’t a good match to your organization. It may be tempting to try TOO hard to meet their needs as you chase after a big gift that no longer looks likely. If you find yourself changing your mission or priorities for the sole purpose of getting the gift, you’re not doing yourself OR the donor any favors. Stay true to your mission and your objectives – you may have to walk away from this one but it’s best in the long run. Help the donor by recommending another, more compatible, nonprofit. You’ll help them meet their philanthropic goals and establish yourself as a nonprofit that can be trusted. Again, everyone is a winner. If you believe in the whole karma thing, it’ll pay off in the long run. 15 x 2 = 30. . . And that’s a bunch! This post may have less to do about fundraising and more about me complaining, but if you squint really hard you can link the two. Especially if you travel quite a bit as part of your fundraising activity. You see, I have a problem. It’s a loss of in-flight productivity due to the ‘no electronics during takeoff and landing’ rule. CNN had an article today about the use of cell phones during flight, and the actual danger involved. The jury is still out, but that isn’t my problem. I have no problem with the ban on cellular phones and the like. 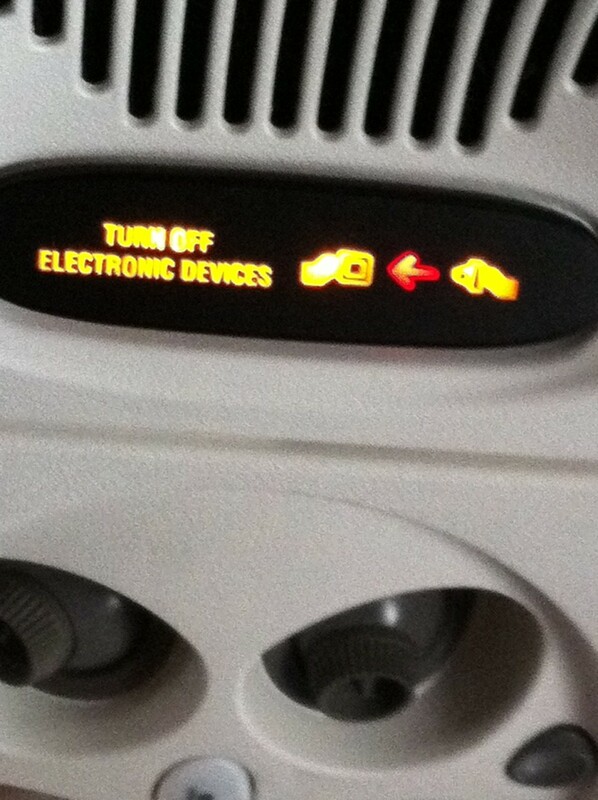 My problem is the ‘absolutely no electronics’ rule, which is entirely different! Just about every device known to man now has an ‘airplane mode’ allowing you to turn off any transmissions that may (or may not) affect an airplane’s systems. Personally, I don’t think there is any chance that the FAA or TSA would even let these items on board if they caused a threat, but nonetheless why can’t I just turn on the safe mode and work away? Some say it’s about paying attention to the flight attendant’s safety advice. I don’t buy it. If I can’t figure out how to buckle a seatbelt, I probably don’t own a smartphone, iPad or Kindle. Few pay attention anyway. Some say it’s about the weight of the object and the fact that it might fly out of my hands and injure somebody if the plane crashed. I’m not buying it. My latest Tom Clancy novel weighs significantly more than my iPad, and the odds of that making a difference during a crash are insignificant. The reality is that in most crashes, being hit by a flying iPad is the least of my worries. Some say it’s about people who would abuse this and keep talking on their mobile phones, leading to interference with taxiing and navigation. I’m not buying it. Airlines readily tell you to start chatting as soon as you land. This is during that critical taxi time back to the airport terminal. No worries there. The fact is, I want to be productive during the takeoff and landing. This is easily 15 minutes on each end of the flight, for a total of almost half an hour. On short hops, this could account for a big percentage of total flight time, and I hate sitting there bored out of my mind. OK, I’m done whining. And, by the way, I DO consider playing Angry Birds to be a productive behavior!! We all know the treatment of our organization’s supporters impacts their behavior. 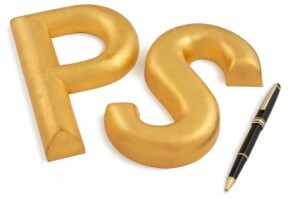 We strive for higher renewal rates, more gifts, bigger gifts, etc. and tie it all back to how we treat those who give. Is our receipt timely? Did we thank them properly? Are we sharing how their support made a difference? We often forget, however, another equally important factor: people talk to each other. I came across a video last week about a customer receiving exemplary customer service at a Marriott hotel. He happens to be a speaker on the topic, and tells the story of an employee named Maria Garcia. He continues to tell the story, partly because it’s his business and also because he was touched by the woman’s good deed. In short, he became an evangelist for Marriott because of a single act of kindness. I have no idea if this story is 100% accurate, embellished, or even completely fabricated. It really doesn’t matter. The story is the story. Perception is reality. And today many many people have heard about a terrific Marriott employee who went above and beyond the call of duty. There are plenty of stories, good and bad, about your nonprofit. They’re being told every day by your happy donors, your frustrated donors, and by those who stopped giving because they were fed up with something you did. It would be wise to keep Maria Garcia’s story in mind when you’re working with others. Your actions, even those which may seem insignificant, will impact you (and your nonprofit) in ways unknown. We expect our board members to ‘share the good word’ about our organizations. We want them to tell others about the good work we do, how great we are, and why they should become involved, too. It would be nice if others did the same. Why not strive to provide a level of customer service that creates an army of evangelists? The end result is certainly worth the effort. Maria Garcia has been promoted. Marriott is getting free advertising. Your nonprofit might just receive something nice too!